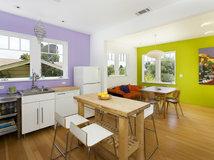 Purple is a tricky color to work into a home's interior. 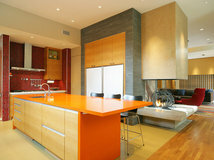 Dramatic and moody, it can veer toward garish if combined with too many other vibrant colors or fussy materials. Large expanses of pastel purples can come across as overly sweet and girly, while too much deep purple tends to make a space feel gloomy, dark and cavelike. 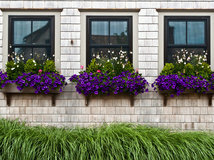 But purple can be terrific on the oft-overlooked exterior. 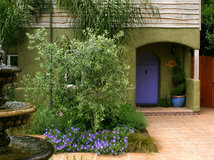 The entry to your home should be attention getting — why not do that via a gorgeous purple color on your front door? 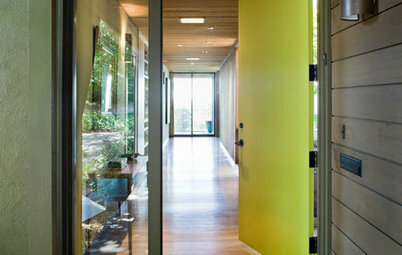 It won't appear too busy in such a small dose, and with abundant natural light it won't feel too heavy or gloomy. 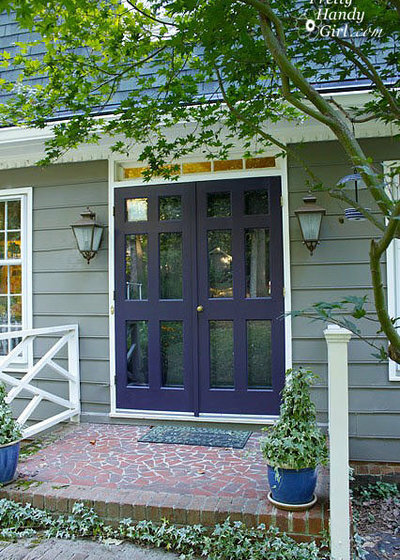 Check out these eight examples of gorgeous purple doors, along with suggested palettes that include siding and trim or accent colors. 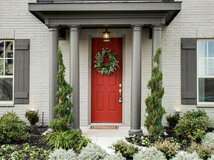 If the exterior of your home has a light neutral hue, the best way to call attention to your door is to go with a contrasting deep, dark color. 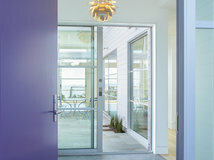 This bluish purple reads as a neutral, making this palette feel calm, cool and restrained — perfect if you like purple but want to go with a relatively neutral exterior palette. 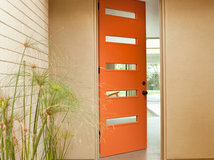 Note: If your door gets hit with a lot of afternoon sun, a dark color will absorb heat and may fade more quickly than a lighter hue. Example palette: Get a similar look with (clockwise from top left, all from Pittsburgh Paints): King's Robe 246-6, Dill 310-5 and Fisherman's Net 512-4. 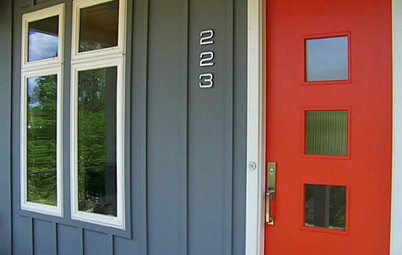 If your home has a medium gray exterior, similar to the one here, you can dress up your door in any color you desire. 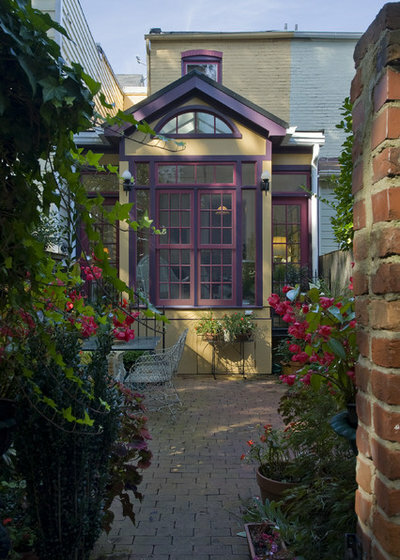 This saturated purple with a bit of red in it is an excellent choice, especially in concert with the wood-clad overhang ceiling, which reads as a warm orange-red. 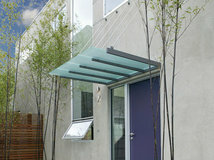 This unusual palette warms up this contemporary home and makes the entry welcoming and inviting. Example palette: Get a similar look with (clockwise from top left, all from Pratt & Lambert): Tulip Purple 30-14, Orange Bead 6-16 and Kid Glove 26-28. 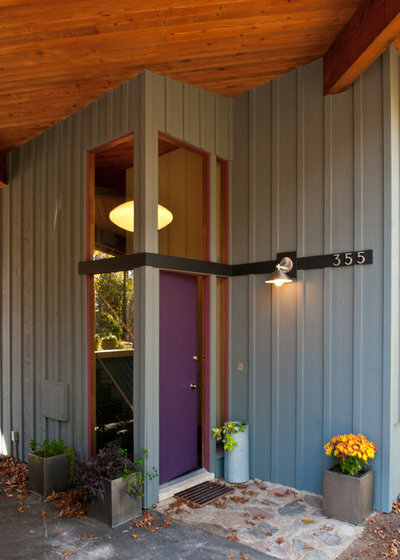 This door sports a beautiful cool bluish purple that helps it stand out against the olive-green and light taupe siding. 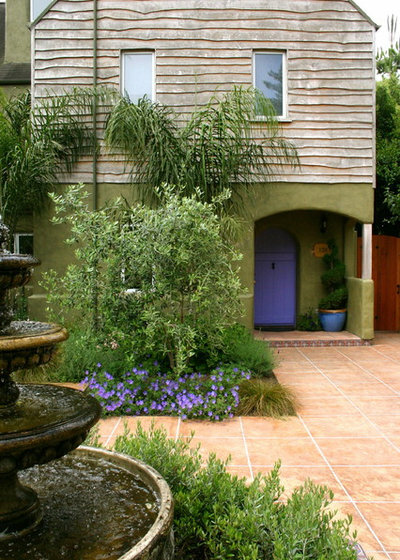 I like how the landscaping picks up the house's exterior colors and the warm-hued pavers offer a clean, welcoming path to the front door. 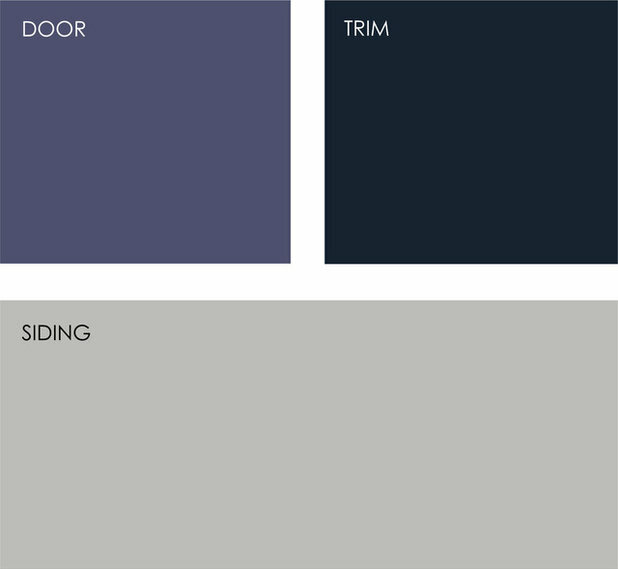 Example palette: Get a similar look with (clockwise from top left, all from Sherwin-Willams): Luxe Blue SW6537, Black Swan SW6279 and Destiny SW6274. 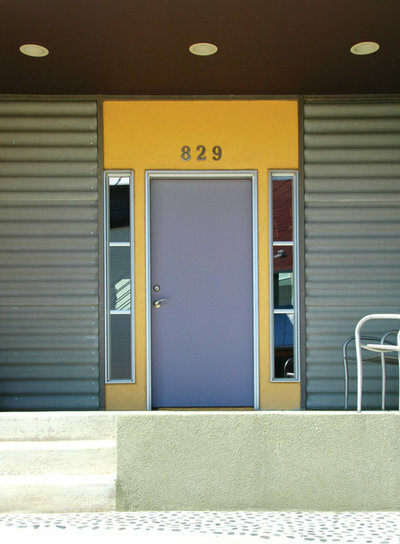 This is a very cool and striking palette. 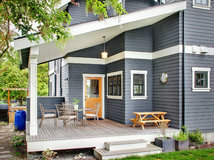 The purple has quite a bit of inky blue in it, making it appear almost navy or black, and the siding color is one of those complex hues that sometimes reads as gray, sometimes blue, sometimes green. 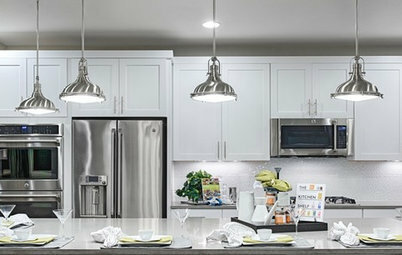 The white trim gives each element a clean, crisp edge. 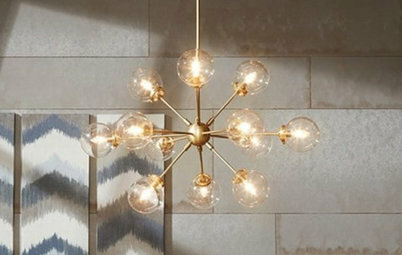 Example palette: Get a similar look with (clockwise from top left, all from Kelly-Moore): Evening Magic KM3104-5, Drizzle KM3785-1 and Raw Steel KM3836-2. You could easily do a variation on this palette using your favorite vibrant hue. 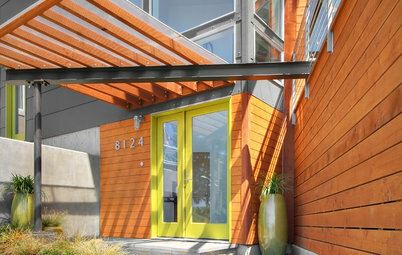 If you keep the main exterior color neutral, simply select two hues that are near each other on the color wheel (for instance, lime green and lemon yellow, or turquoise and navy blue). This will give you a colorful palette with just enough restraint. Example palette: Get a similar look with (clockwise from top left, all from Benjamin Moore): Old Claret 2083-30, Mauve Bauhaus 1407 and Barbados Sand 1094. Here's another fun palette that again is not for everyone. 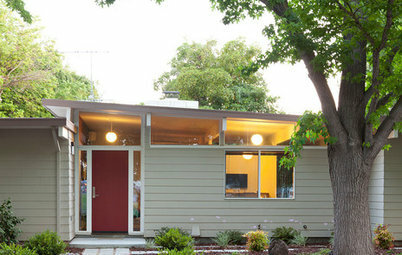 Because the main house color is a light off-white, the small square chunks of vibrant color look clean, bold and modern — reminiscent of an abstract expressionist painting. 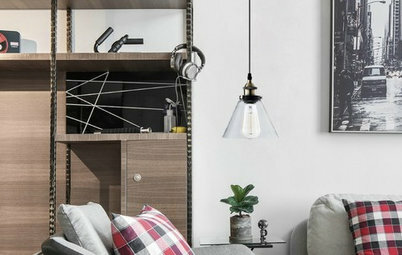 I love these colors and how they are used, but what's great about employing bold color as a decorative element is how relatively easy and affordable it is to repaint with a different set of bold hues or neutrals for a completely different look. 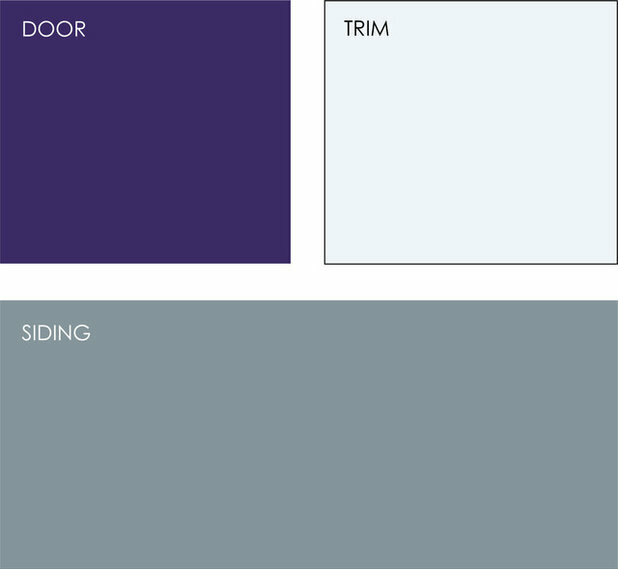 Example palette: Get a similar look with (clockwise from top left, all from Mythic Paint): Blue Bomber 015-5, Spanish Saffron 095-5, Arapaho Valley 079-6 and Morning Song OW-5-3. 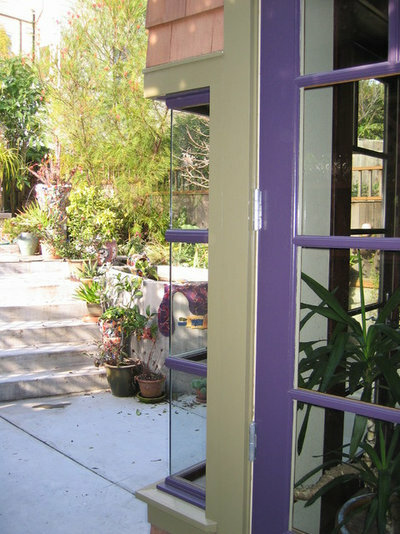 If you prefer a purple shade that's more on the lavender side, pair it with a bold yellow hue to make the lavender really stand out. 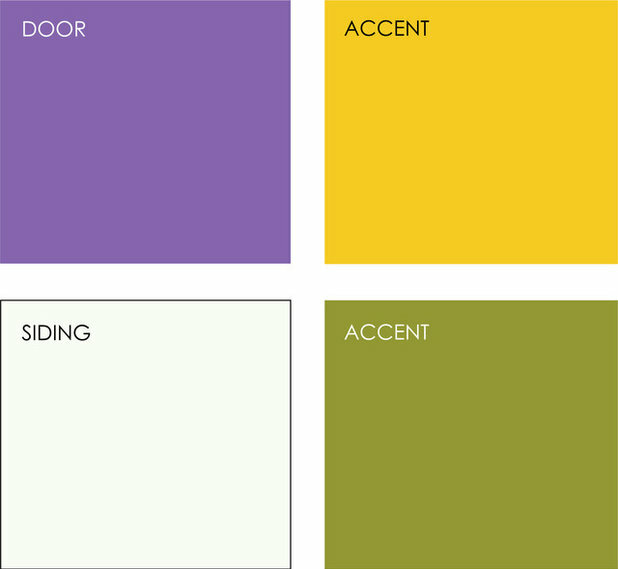 Purple and yellow are complementary colors — opposite each other on the color wheel — so they offer the most contrast to each other when used in combination. 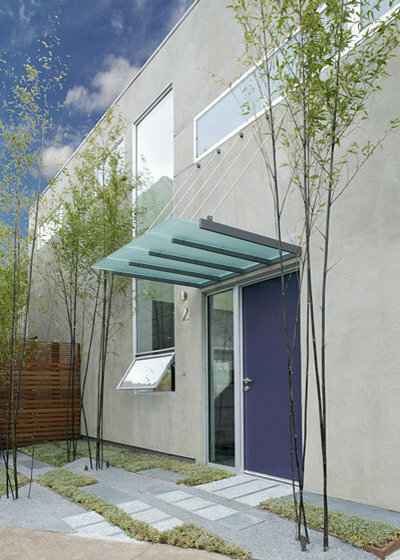 In small amounts against a neutral background, in this instance light gray corrugated metal siding, the two colors look great. 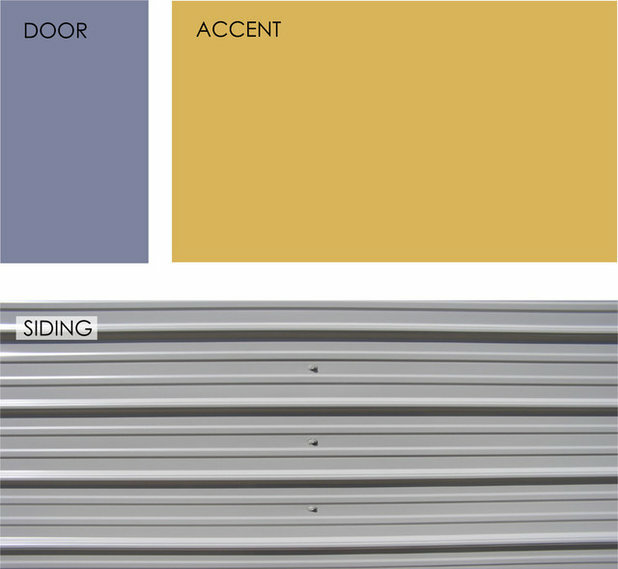 Example palette: Get a similar look with (clockwise from top left, all from Sherwin-Willams): Indulgent SW6969 and Sunrise SW6668, with corrugated metal siding. 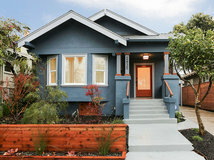 My strategy for picking out an interesting exterior paint palette is to select two neutrals and one bold hue. 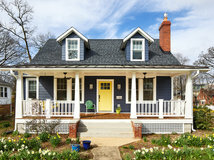 Generally you want to paint the largest portion of your home — the siding — one of the neutrals. 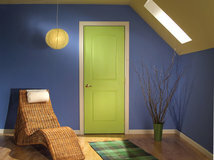 Then use the bold hue for doors, trim or accents. 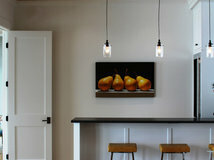 The second neutral should coordinate with the main neutral, but you want it to be different enough that it reads as a completely different color; otherwise it can look like you were trying to match colors and made a mistake. 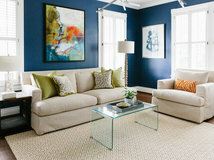 Use this second neutral as a trim or an accent color. 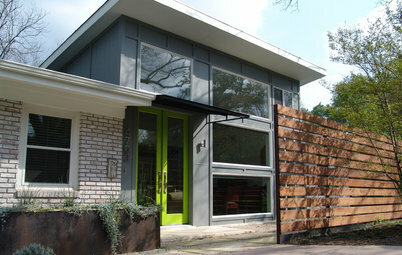 Here the wood siding serves as the main neutral and reads as a light tan-taupe color. 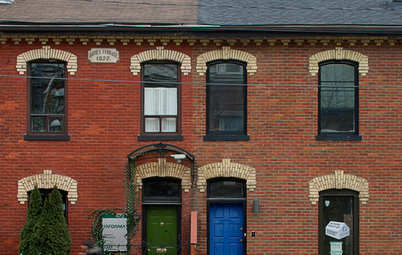 The soft olive green also reads as a neutral, and they both serve as a nice supportive ground for the bits of deep purple on the door and window frame. 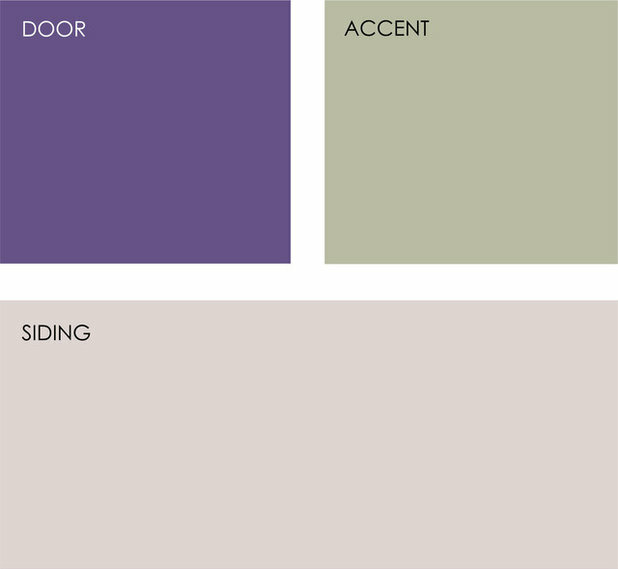 Example palette: Get a similar look with (clockwise from top left, all from Valspar): Twinkle Night 4004-8C, Willow Wind 6004-3B and Vanilla Steam 2006-10C. 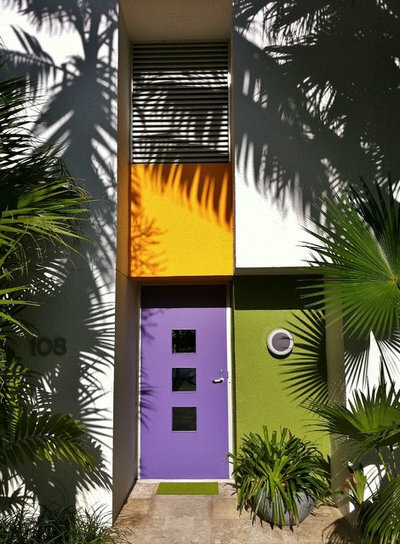 Tell us: Would you paint your door purple? it with gentle violet 2071-20. 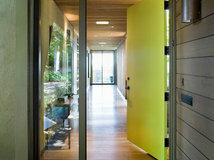 This, in order to obtain a bit of an antique look to the door. The blues, grays and purples seem to blend in very well. 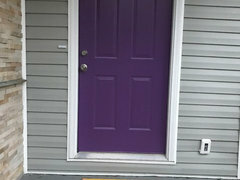 I love my purple front door, painted with SW Fabulous Grape. Mine is Sherwin Williams’ Amethyst.